Research conducted at the Smart Structures Technology Laboratory (SSTL) at the University of Illinois at Urbana-Champaign is dedicated to improving the performance of structures to dynamic hazards such as wind and earthquakes. The purpose of this research is to apply passive and active control techniques in a vibration system. To investigate these techniques, a three story, two bay shear building has been constructed for testing in the Smart Structures Technology Laboratory at the University of Illinois at Urbana-Champaign. 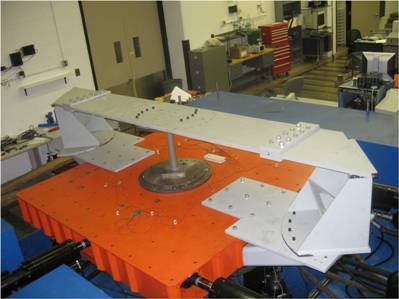 The flexible structure will be placed on a base isolation layer and three actuators will be mounted to the lowest level, thus providing both passive and active control. The three actuators will control in-plane motion (X-axis, Y-axis, and rotation in the XY-plane). A control program will be developed and used to reduce the building accelerations in addition to reducing the base shear while maintaining reasonable base displacements. Current efforts focus only on structural identification and control of the in-plane motion with the building mounted to a fixed surface. The control program will use only floor accelerations and displacements from the three actuators as feedback. From the results of these initial efforts, the design methodology will be extended to the development of a full three dimensional control. Hybrid testing combines experimental testing and analytical simulation in an efficient experimental framework. When rate dependent phenomenon is of significance, real-time execution of the hybrid test is necessary. In a real-time hybrid test, the dynamics of the testing system become important. Research is underway to improve methods to compensate for these dynamics. Verification experiments include the testing of magnetorheological (MR) dampers complete with structural control algorithms. Skew bridges are commonly used by city planners and transportation officials, yet during previous earthquakes several skew bridges have failed catastrophically. Failure mechanisms include: pier failure, deck unseating, and expansion joint failure. The AASHTO design guide recommends treating skew bridges as irregular structures and analyzing with a non-linear three dimensional time history analysis. The complex coupling of vibration modes and the effects on the reinforced concrete pier must be understood and addressed in current design codes to prevent future bridge collapses. To gain a better understanding of this complex behavior, shake table tests of a 1/20 scale skew bridge are being conducted in parallel with FEM analyses. The objective of this project is to investigate the potential for establishing the existence of nominal subsurface structures. Analytical and numerical parametric studies will be used to quantify the impact of below ground structures on the dynamic response of buildings. The objective of this project is to develop a framework which integrates NEES-type hybrid simulation with free-field and structure sensor measurements, system identification-based model updating technology, probabilistic fragility analysis, and earthquake impact assessment packages (e.g. HAZUS and MAEviz), as well as to develop a pilot implementation of the framework using the Cape Girardeau instrumented bridge. Algorithms will be developed or adapted and communication protocols formulated to link sensor measurements directly into the NEES system. Free field measurements will be used to characterize the hazard at the site and define strong motion records, and the structural sensors used to tune the bridge-foundation-soil model. Hybrid simulations will be undertaken using the model and input motion, while changing the design of one or more (up to three) of the supporting piers. The response of the bridge with variation of the ground motion and pier response will be used to derive fragility relationships which, alongside the hazard, will be used to estimate earthquake impact. In this manner, the relatively mature sub-disciplines responsible for developing the above components will be tested in an integrated manner towards the ultimate goal of NEES under NEHRP, which is the assessment and mitigation of earthquake losses. Feedback, especially to the simulation (including hybrid) researchers on features needed to improve the integration of components of earthquake impact assessment, will be of great importance to further development of simulation and to rendering the NEES approach to assessment of immediate use to the community. Work is being done to develop and enhance damage detection methods which are suitable for implementation in a smart sensor network. The research in this area has ranged from numerical simulation to experimental validation and incorporates many types of structural response and excitation. Multi-scale sensing using a heterogeneous mix of measured data at various scales has the potential to provide for more accurate characterization of the state of a structure. A damage detection approach using multi-scale sensing has been proposed, and the experimental verification is underway. This research is focused on the use of wireless smart sensors for structural health monitoring applications. The goal is to implement SHM algorithms on a network of wireless sensors that is scalable and robust. 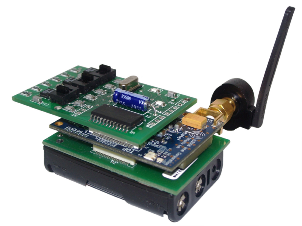 This research utilizes the Imote2 smart sensor platform which provides the computational capacity required for demanding, high-frequency applications such as SHM. 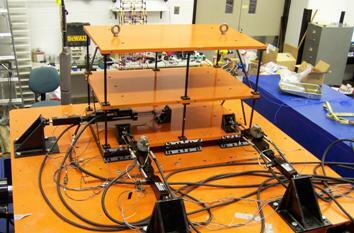 A laboratory prototype system has been experimentally validated. 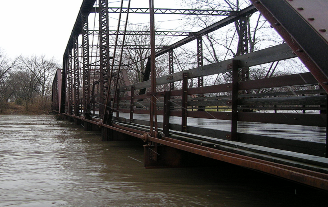 Current efforts are underway to realize a full-scale application on a historic truss bridge in Mahomet, Illinois. Additionally, work is being done to customize sensor boards for the Imote2 that are tailored to SHM applications. This work is being done in collaboration with members of the Open Systems Laboratory run by Prof. Gul Agha in the Computer Science department at the University of Illinois. More information on this collaboration (The Illinois Structural Health Monitoring Project, ISHMP) can be found at http://shm.cs.illinois.edu. This research focuses on the implementation of SHM on a full-scale bridge structure. 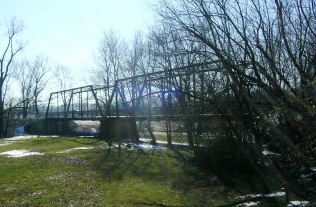 The test bed is a steel truss bridge in Mahomet, IL. This historic bridge was built in 1912 and now serves as a pedestrian bridge. Located in central Illinois, the bridge is exposed to varied conditions due to the extreme temperature fluctuations and frequent floods. A series of dynamic tests using state-of-the-art wired sensor system have been conducted regularly since January, 2007. The main goals are the system identification of the bridge, numerical model updating using the experimental data, and validation of developed damage detection algorithms. In the near future, smart sensor networks are to be implemented using Motorola phone base station on this bridge. The final goal is to realize a continuous structural health monitoring system using smart structures technology.